Only one foreign flag has ever flown atop Ottawa’s Peace Tower: that of the Netherlands. The occasion was the birth of Princess Margriet in Ottawa in 1943. To celebrate her 70th birthday, the unique historic gesture was commemorated this year on Parliament Hill. In a small ceremony in sub-zero temperatures, the flag of the Netherlands was raised in front the Canadian Parliament in Ottawa today to celebrate the 70th birthday of Princess Margriet of the Netherlands. On the steps in front of the Centre Block, the red-white-blue flag was hoisted on a special flagpole as the Dutch and Canadian national anthems were played on the carillion bells of the Peace Tower. The flag-raising was met with enthusiastic thuds of applause from the gloved hands of a small crowd braving the extremely cold temperatures. Among those present at the celebration were some Canadian MPs of Dutch descent, including Conservatives Rick Dykstra (St. Catharines) and Rod Bruinooge (Winnipeg South), and New Democrat Peter Stoffer (Sackville – Eastern Shore). The flag waved in bone-chilling wind against a crisp blue sky with temperatures of about -20 degrees Celsius, to commemorate the day, 70 years ago, that the Dutch flag was raised on top of the Peace Tower, the centrepiece of Canada’s federal Parliament. Princess Margriet was born in Ottawa on January 19, 1943. Her mother, then Crown Princess Juliana, stayed in exile in the Canadian capital during the German occupation of the Netherlands. The Canadian government temporarily declared the nursery room at the Civic Hospital in Ottawa where the younger sister of Queen Beatrix was delivered to be Dutch territory, so that the birth took place on Dutch soil. Even more remarkable, it could be argued, was that the Dutch flag was flown on the iconic Peace Tower to celebrate the birth of the Princess – the only time in history that a foreign flag was flown on Canada’s Parliament. 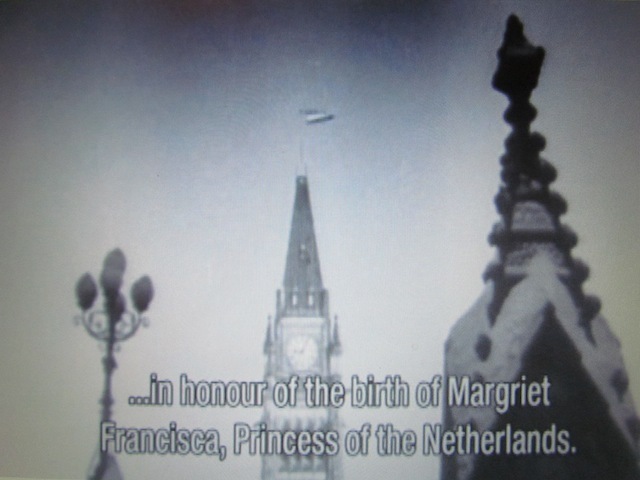 The Dutch flag atop the Peace Tower, to celebrate the birth of Princess Margriet in Ottawa. It will likely remain the only time, as requests to hoist the Dutch flag again over the Peace Tower, a widely recognized symbol of Canada, were rejected for reasons of protocol. The flying of the Dutch flag to mark the birth of Princess Margriet, the only member of a royal house to have ever been born in Canada, will therefore remain a unique historic honour. “The birth of Princess Margriet has contributed to a special relationship between Canada and the Netherlands, a bond that is still strong,” said Dykstra. The liberation of the Netherlands by Canadian troops at the end of World War II, and the residence of the royal family in Ottawa are at the basis of that special relationship. 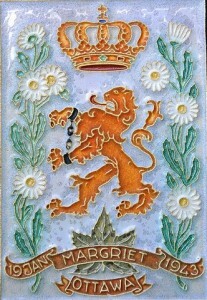 In the Netherlands, under German occupation, the birth of Princess Margriet was marked by this commemorative plaque, with daisies and a handcuffed Dutch lion. During her stay in Ottawa, Princess Juliana lived with her daughters in the Stornoway mansion, which is now the official residence of Canada’s leader of the opposition. As a token of her gratitude, she sent tulips to Ottawa after the war, setting the stage for an annual tradition: every spring, the Ottawa Tulip Festival is one of the top events in the Canadian capital. After the war, a large number of Dutch citizens immigrated to Canada. Today there are more than 1 million Canadians of Dutch descent, of a total population of about 32 million. Princess Margriet was not present at the flag ceremony, but she visits Canada regularly. Last year, she received an honorary doctorate of Laws at McMaster University in Hamilton. 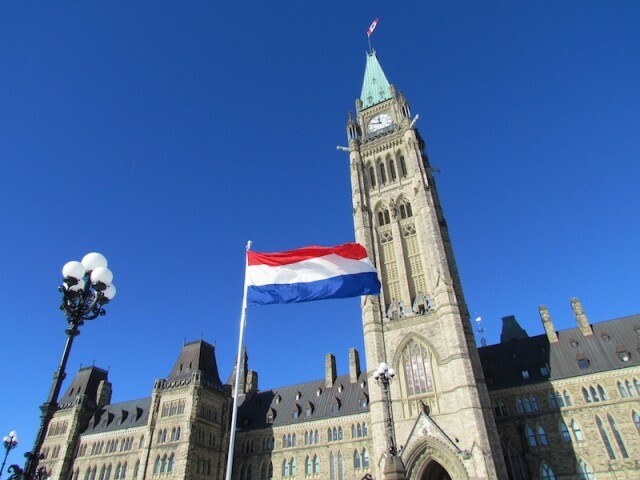 The flag of the Netherlands in front of Parliament’s Centre Block in Ottawa.